TL and I are so fortunate that we get to spend so much time in San Francisco. It's just a quick car ride away! This last weekend, the weather was incredible. 80 degrees, sunny, beautiful. Friday, by the direction of some business people we met, we ate lunch at Trademark - which is on this tiny alley full of restaurants. It reminded me of an alley you would see in Europe. They had all different restaurants, and all different types of food. Trademark is American cuisine, but at its best! It was delicious. We are definitely going back to that Alley next time we want a new place to eat! 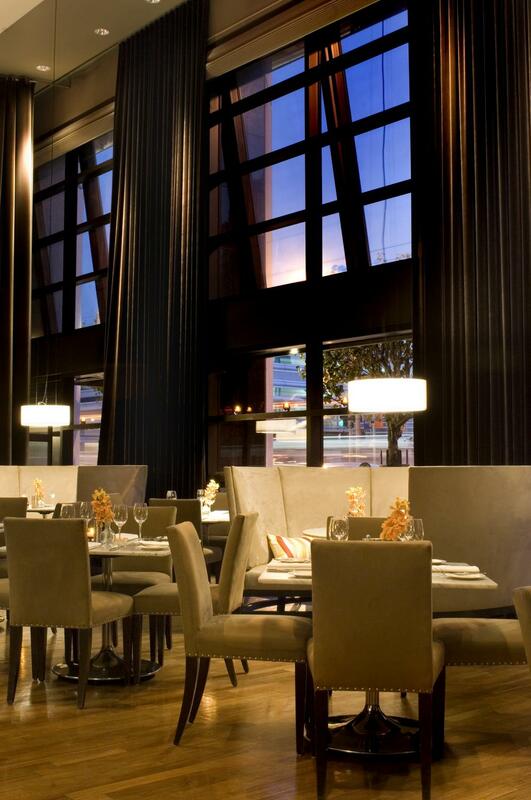 For dinner, we ate with my MIL at XYZ, which is a hip little restaurant at the bottom of the W Hotel. It was really good food, too. Some of the best risotto I have ever had! 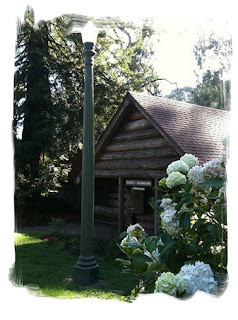 On Saturday, we did some exploring of Golden Gate Park. TL hadn't really been there, and the handful of times I have been through college, I haven't done much walking around. 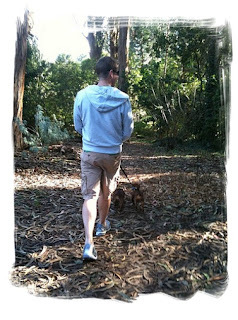 We (& the pups) walked for almost 2 hours and I was amazed at how lush and beautiful the grounds are. There are some amazing museums there, as well. We randomly ran into a few of my sorority sisters outside of one of the museums - so fun to see them! TL walking with Maximus & Zeus - they went "off roading" so the pups could take care of business. 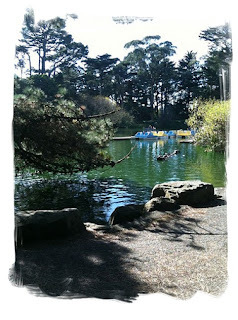 There is a lake in GGP and they have paddle boat & bike rentals. 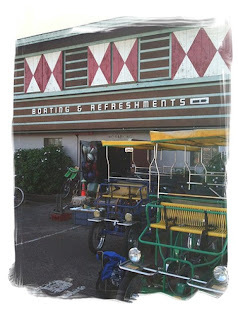 We vowed to rent a paddle boat next time we go! Cute log cabin nestled in the trees - and beautiful hydrangeas! This is that little lake - hard to see, but there were a ton of turtles sun bathing on one of the logs. And, Sunday - we went to the Niner game with my dad and BIL, Joe. It was an awesome game - Niners won in overtime against the Rams. It was perfect weather, too, for a ball game - no jacket needed! Hope you're having a wonderful Tuesday! What a great weekend!! Great pics too!! Mini vacays are the best, it's so nice just to get away sometimes!! What a fabulous weekend! You got some fun pictures too! I am going to SF in a couple of weeks and it will be my first time! You've given me a few ideas of great things to do. Thank you! Definitely going to have to check out those restaurants! (My boyfriend is from SF and we're moving back there in a year :) ) Thanks for sharing! I just stumbled across your blog, and I love it! I'm excited to have a new place to visit everyday! I wish I would have made it to SF over the weekend, I heard it was perfect. It was super nice in the East Bay. 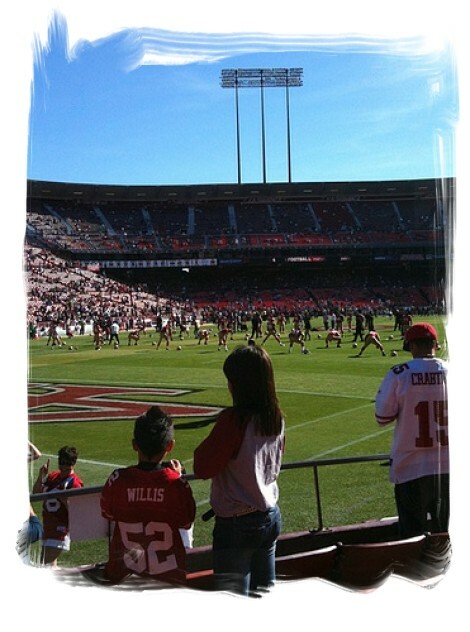 My hubs went to the Niners game and had a blast! First of all, I want to thank you so much for all of your kind words of encouragement and support. I also really appreciate you "liking" our organization's facebook page. 80 degrees must have been nice! It's been so damp and nasty here. If I were you, I'd definitely take up the paddling boat next time. Glad to hear you had fun. You're a beautiful and sweet girl. I love San Fran - I'm so jealous that you can just go there for a weekend! (I feel like I say this to you a lot). This sounds so perfect - all the restaurants look amazing and I'm going to bookmark them for my next trip there! Do you ever go to Ghirardelli Square for ice cream? Yum, I know it's tourist-y, but I still dream about the hot fudge there :) (I can't believe I'm not 500 lbs!). Color me jealous. What a perfect getaway! I'm dying to visit San Fan and Napa. Chocolate and vino...Mmmmmmm! Love the pictures... I so want to go there! I am glad you guys had a nice mini-vacay! So glad you found my blog...so I could find yours. I love it. I use to live in the bay area and I miss it. Have a great day. i was in the city too this weekend and it was AMAZING weather! :) i just book marked the alley restaurants, we'll have to try that next time. Sounds like an amazing weekend! And those restaurants both look amazing! Not that Milwaukee is as big a city as San Fran, but it's the biggest city in Wisconsin. I'm moving back to the town I grew up in soon... and it's pretty small. I will definitely miss the amazing restaurants that come with a big city! What a fantastic weekend! My girlfriends and I do date nights at Belden Place all the time! Love it! darnnit for always missing each other when you're here! My gosh what a lovely weekend!! Loving the pics! I love San Francisco! Golden Gate Park is amazing. P.S. I'm in the Orlando chapter of Junior League, in my second year. Love it! !